Blue Red iridescent dupioni silk fabric. Brand New High-end dupioni silk yardage. 45 inches wide. This is very strikingly iridescent! 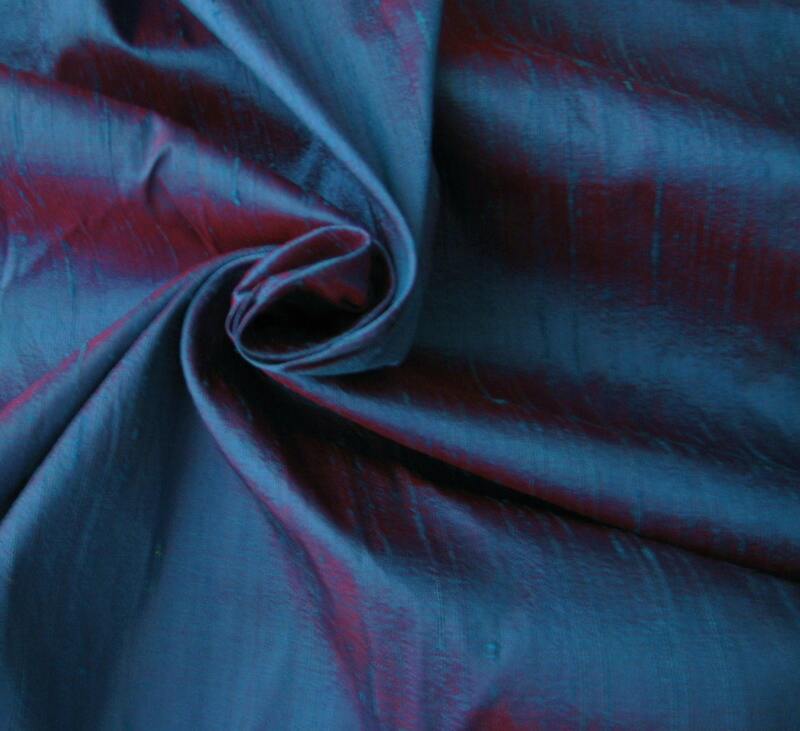 This is for one roll of Blue Red iridescent 100% Dupioni Silk Fabric with a minimum of 32 yards. Please Note: Our rolls vary from 32 to 35 yards and you will receive a minimum of 32 yards for the price. $100 off our total by the yard price. You pay ONLY $575 for the whole roll/ bolt plus shipping. Shipping for the roll is $29.99 in the 48 contiguous US states. Allow 5 to 6 business days for delivery in 48 contiguous US states. Hawaii, Alaska, & other US territory: Allow 10 business days for delivery and shipping charges to Hawaii, Alaska, and other US territory will be $45 per roll. Canada Shipping charges: $69.99 per roll and allow 12 to 16 business days for delivery. Shipping charges to ALL INTERNATIONAL countries EXCEPT Canada: $95.95 per roll and allow 12 to 16 business days for delivery. These are reorderable so once you need more, you will be able to get more quickly. These are NOT discontinued. We have a smoke-free warehouse in the USA so no order too big. If you need more than what is listed, let us know because we have a lot available ready to list. *This is a medium weight dupioni silk but on the heavier side. As one customer told us, "Yours is an excellent quality and it has a nice body to it and is not flimsy like many others". *It is highest quality dupioni you can find. Retails for $40 to $60 per yard. *This dupioni is perfect for bridal & bridesmaids dresses, quilting, pillows, & chair upholstery. *Lovely iridescent and tone-on-tone colors are available. *It is handmade and has a texture. If you want to order a 2 inch x 2 inch dupioni fabric swatch to see the exact color, search for swatch in our store. Swatches will be $1.50 per swatch including FREE USA shipping. Contact us for a custom listing. We tend to reply to any questions quickly because we check our messages very often so do not hesitate to ask us. We have been in business for over 30 years so you can trust us. We started on etsy in November 2011 so you can now see our feedback! You will be delighted with our quality and our customer service! SATISFY THE DESIGNER IN YOU! Payment must be paid within 36 hours of purchase. You can pay by paypal. California residents pay 7.25% sales tax to your purchase and Alameda county residents pay 9.00% sales tax except Union City and San Leandro that pay 9.50% or 9.25% sales tax respectively. You can choose shipping within the USA. Eiither first class in 2 to 5 business days or priority mail in 2 to 4 business days including handling time or priority express guaranteed anywhere in the USA in 1 to 2 business days. Shipping charges as stated within the USA. We will send each package with FREE delivery confirmation within the USA. First class or priority international shipping to Canada and other International countries. Allow 2 weeks for delivery to Canada or other international countries. Unfortunately, we do not offer refunds as we cut the fabric according to your size including custom listings with custom sizes. We offer great quality and we stand behind our quality. We offer a low everyday price for our 100% dupioni silk. In order to keep this price and also to offer the best quality, we cannot offer returns. You may purchase a 2 inch swatch to see the exact color before purchasing yardage and highly recommend this before purchasing the 32 yard bolts. You may order a 2 inch by 2 inch swatch for $1.50 including FREE USA shipping to see the exact color by contacting us. International swatches ship for $1.50 flat fee for unlimited swatches. We do wholesale as well!